Life is still hectic, we had a wonderful time at the Hugglets show and I can't believe that it has been almost two weeks since then. It was so nice to meet friends and collectors, see all the lovely bears and buy new fabric. 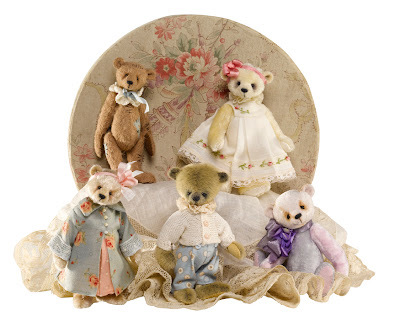 The wonderful photo is our selection of bears for Teddy Bears of Witney. We have lots of orders to complete so we have lots of stitching to do. I only managed to finish two tiny bears for the Miniatura show and posted them off today without taking a photo, not very organised at all. Then when I was stuffing a panda's head I wasn't concentrating and managed to make a hole in the fabric, so have to make a new head. Hopefully I will get some work finished this weekend. Oh my I do feel for you poking a hole in the head. How frustrating. You are lucky you have enough fabric. It was great seeing you both at Hugglets. I had such a good time. I love all your bears for Witney. Are they available through their web site soon?